Mary Catherine May, 98, Nevada, passed away on Monday, Aug. 13, 2018 at Moore-Few Care Center in Nevada. 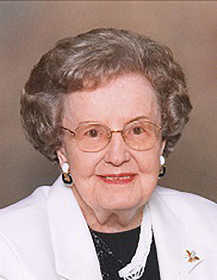 Mary Catherine Lenard Griffith was born Feb. 7, 1920, in Owensboro, Ky., to James and Mary Lillian (Woodward) Griffith. Mary Catherine attended Western Kentucky Teachers Collee in Bowling Green, Ky., majoring in Home Economics. She married William (Bill) May on July 15, 1940. Mary Catherine was devoted to her husband and children and provided a wonderful home environment. She also focused on teaching Sunday School, Women’s Missionary Union, and sewing club. Mary Catherine loved to cook, sew, knit, crochet, and read. Survivors include her son, Sterling, R. May, Gardner, Kan.; daughter, Marilyn Martin (William Martin), Nevada; grandchildren, Laura Conrad (Lounis), Katie Yuseuf (Arman), and Jacob Conrad (Laurel); great-grandchildren, Jacob Bita, Gabriel Bita, and Hazel May Conrad. She was preceded in death by her father, James Griffith; her mother, Mary Lillian Griffith; her sister, Bessie Deane Haynes; and her husband, William Sterling May. Graveside services will be held at 11 a.m., Monday, Aug. 20, at Ft. Gibson National Cemetery in Ft. Gibson, Okla., with Bill Martin officiating. Services are under the direction of Ferry Funeral Home in Nevada. Memorials are suggested in her memory to the MS Foundation in care of Ferry Funeral Home.